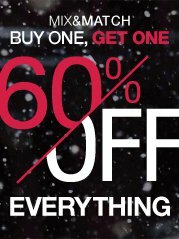 Mix and Match Buy One, Get One 60% Off on everything. Yes, everything! Better hurry, this offer is only good through December 14th. Offer valid in U.S. only (including Puerto Rico). Not valid at Gap Outlet, Gap Factory Stores, The Gap Generation, or online. Second item must be of equal or lesser value. Discount taken at register, and is allocated across items. No adjustments on previous purchases. Cannot be combined with other offers or discounts. IF you have not joined our Casa Paloma Facebook fan page yet, please do. Every store in the Valley has their own Facebook pages, but not all of them are updated as consistently Casa. You will also find more promotions listed just for our Facebook fans.